Remains of Vernon Olsen will be interred Wednesday in the battleship USS Arizona, on which he served and where 1,117 sailors and Marines died Dec. 7, 1941. Vernon Olsen, 91 — who survived the Japanese attack on Pearl Harbor aboard the battleship USS Arizona, swam away from the carrier USS Lexington as it was sinking during the Battle of the Coral Sea months later, and took part in the Bikini Atoll atomic bomb tests after the war — died Friday, April 22, 2011 in Port Charlotte, Fla.
Olsen will be going back to the Arizona. 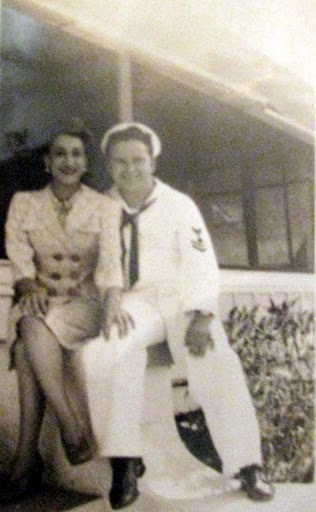 The family plans to bury his ashes at the national memorial in Pearl Harbor, according to his wishes. The U.S.S. Arizona, bombed during the Japanese attack on Pearl Harbor, on Dec. 7, 1941, was sunk. 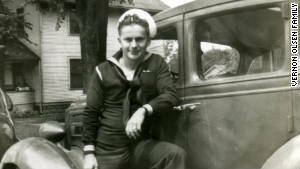 Vern Olsen was a sailor aboard the ship. His remains will be brought to the Arizona Memorial, according to his wishes. “When the Japanese attacked, I went to my battle station 150 feet above the deck on the aft mast of the battleship,” the old sailor said. “My post was behind a .50-caliber machine gun minutes after they flew over and started bombing. The enemy planes were close enough he could have hit them with a rock, he said. “We didn’t have any ammunition and we didn’t have the keys to the ammunition locker. All we could do is watch,” Olsen said. The U.S. military locked up all explosives in the Hawaiian Islands shortly before the war began. It was concerned saboteurs might steal ammunition and bombs and use them against American forces. It never happened. “It was all over for us in 15 or 20 minutes. A bomb hit the center of our ship and exploded the Arizona’s ammunition magazine. In minutes the ship was covered in smoke and flames,” he said. In the midst of the death and destruction, Olsen climbed down the mast into the fire and chaos below. On the way down he burned both his hands and his arms holding onto the steel rungs of the ladder. “When we reached the deck there were sailors all over the place that had been badly burned,” Olsen said. “By then the ship was listing and oil from the Arizona went into the harbor and caught fire around the battleship. His injuries didn’t require treatment. Olsen watched the last of the first-wave attack on the Pacific Fleet from Ford Island. By then 1,100 fellow sailors aboard the Arizona had gone to their watery graves. Olsen was one of the fortunate. He was reassigned to California and went aboard the USS Lexington, a carrier that was moored at Long Beach. Soon, he and his shipmates aboard the carrier went to sea. Adm. Chester Nimitz, commander of the U.S. Pacific Fleet, dispatched the carriers Lexington and Yorktown to intercept a Japanese convoy of 11 transport ships filled with enemy soldiers. They were headed for New Guinea, where they were to launch an attack against the island’s north coast. The enemy’s ultimate target was Australia, 400 miles away. On May 7, 1942, the two American carriers caught up to the Japanese transports in the Coral Sea. Before the battle was over, the Lexington was severely damaged and had to be sent to the bottom by an American destroyer. 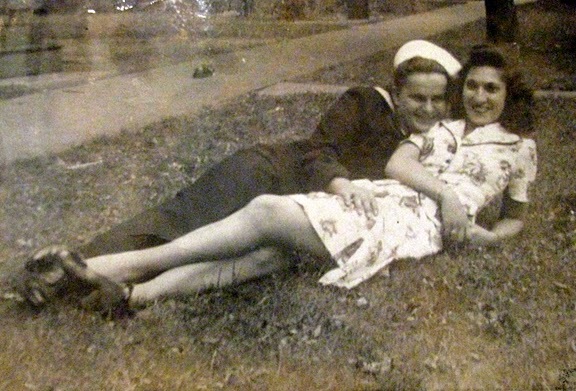 He went back to the states and reported to electrician’s school at Norfolk, Va. By the time he graduated from electrician’s school in 1943, he and Joann, his wife of 67 years, were married. After the Japanese surrender in September 1945 on the deck of the battleship Missouri in Tokyo Bay, Olsen still had a year of service to give his country. He had signed up for a six-year hitch in the Navy in 1940. It was at this point he became a guinea pig at Bikini Atoll in the Pacific. In March 1946, the U.S. nuclear testing program brought in 242 naval ships, 156 aircraft and 25,000 radiation recording devices. The Navy contributed 5,400 experimental rats, goats and pigs to the cause. What isn’t mentioned is that shortly after the first atomic blast, the Navy sent an undisclosed number of Navy personnel to the bomb-decimated island in unprotected clothing. It wanted to learn how they would react to nuclear radiation. Olsen was one of those lab rats. All of this testing involving naval personnel was kept under wraps by the military until years later, when many of those who were exposed to radiation on Bikini started dying in large numbers. Vernon Olsen was one of the lucky ones who survived several major battles in World War II and lived to talk about it for many decades. He was a regular at the annual Fishermen’s Village Pearl Harbor Service each Dec. 7 in Punta Gorda, Fla. This story was first published in the Charlotte Sun newspaper, Port Charlotte, Fla. on 2011 and is republished with permission. Click here to view the collections in alphabetical order in the Library of Congress. .